When I started this blog in 2004, digitization was a growing area in libraries. For some, it was still something new, while others had and were embarking on massive projects. 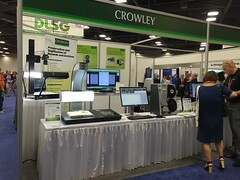 New hardware and new projects/programs garnered attention. For me, Google Book Search ushered in a huge possibilities. Over the years, I've been heartened by the advances in technology, the breadth of projects (even digital collaborations like those discussed at WLIC), and the number of cultural heritage institutions that see digitization as part of what they do. 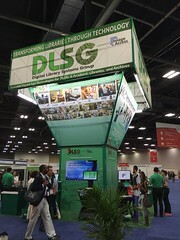 For any librarian interested in digitization, this was a plum opportunity to talk with vendors and to look at hardware. Yes, there was an impressive array of hardware on display for librarians from around the world. In talking with a representative from one of the companies, we went over some of the acquisitions that have happened in the industry. We also talked about where in the world the big scanners are being sold. Not every institution can afford these large, expensive equipment but some institutions can put together programs that are large enough and funded well enough to afford a piece of equipment that costs over $100,000 (U.S.). One positive that has happened over the years is that the technology is less expensive - more affordable - equipment has improved. Look, for example, at the microfilm readers that are also scanners. Look at the equipment meant for end-users (library users) which many institutions have been able to purchase. Yes, even look at the equipment that many of us have at home. 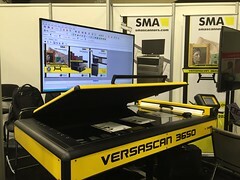 While these printer-scanners are not what a large digitization program would use, they put an ability into our hands that can be used to digitize materials and share them on a personal level. Yes, this was an amazing opportunity for the librarians at WLIC and I hope some took the time to look, talk, ask for a demo, or obtain information to take back home. Seeing this variety of hardware in one spot may not happen soon.